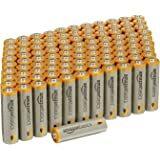 Amazon's Choice for "9v battery"
"Duracell - Quantum 9V Alkaline Batteries - long lasting, all-purpose 9 volt battery for household and business - 3 count"
AmazonBasics Alkaline Batteries are perfect for a wide variety of household uses. 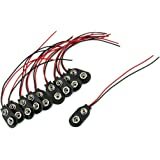 Use them for everyday electronics such as alarm clocks, digital cameras, and universal remotes. Or for emergency supplies such as flashlights and portable radios. And don''t forget playtime with wireless video game controllers, remote controlled cars, and other electronic toys. Having an independent source of power is important during blackouts and other emergencies. 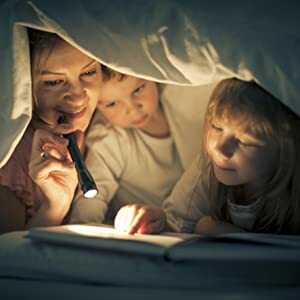 Keep a pack or two of AmazonBasics Alkaline Batteries on hand to quickly be able to power emergency devices such as NOAA weather radios, heavy-duty and LED flashlights, communication devices such as walkie-talkies, and more. 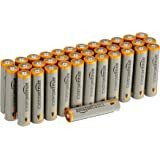 Pack of 8 AmazonBasics 9V Alkaline Batteries. 5.0 out of 5 starsBefore purchasing these batteries I thought All 9V batteries were identical ... Now I know they're not. Before purchasing these batteries I thought All 9V batteries were identical ... Now I know they're not. 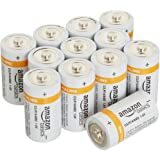 For the most part these AmazonBasics 9 Volt Batteries work great and for the price are an excellent value but there not for everyone and should be used and purchased with caution. 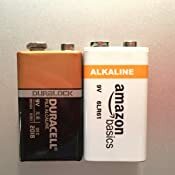 The main problem with these AmazonBasics 9V batteries is they are Slightly Larger than most other 9V batteries and the battery posts or terminals on the top of the AmazonBasics 9V are slightly shorter or protrude less than other name brand 9 volt batteries. The AmazonBasics 9V batteries work well in my multimeter, wireless motion sensor, tone probe and tone generator however they don't fit or work with my wireless microphone, mixer, guitar tuner or CO2 detector. 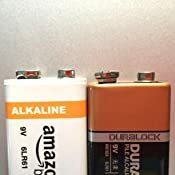 When measuring the length of the battery from the top of the positive terminal to the bottom of the battery the AmazonBasics 9V battery is 0.59mm longer than a 9V Duracell battery. When measuring the thickness the AmazonBasics battery was 0.53mm thicker than a 9V Duracell battery. 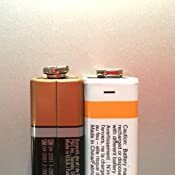 When measuring the height or protrusion of the terminals on the AmazonBasics 9V battery compared to the Duracell it was visually evident that the terminals on the AmazonBasics 9V are lower and when measuring with callipers it turns out they indeed protrude out 0.45mm less than a 9V Duracell battery. After measuring the two batteries I now understand why the AmazonBasics 9V batteries will not work in some of my devices. The AmazonBasics 9V battery is too big to fit into the housing of my CO2 detector and guitar tuner. While the AmazonBasics 9V battery fits into the compartment of my cordless mic and microphone mixer the terminal posts are too short to make contact and therefore won't power up these devices. So What's the Verdict? 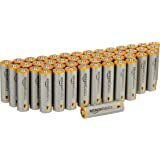 There's no denying these AmazonBasics Batteries are a fantastic deal and if you're a Prime Member you get an additional 20% off bringing the cost per battery down to $1.37 each, compared to $3.24 each for Duracell 9V's. 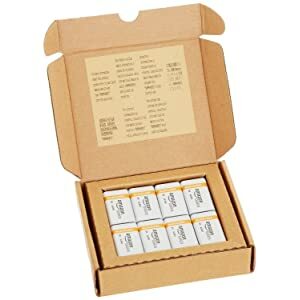 For my uses, I find the AmazonBasics batteries last about 70% as long as the Duracell's so when your factor in price and performance the AmazonBasics 9 Volts are a good value as long as they will fit and work in your device ... and that my friends is the magic question. Unfortunately I will still have to use the more costly name brand batteries for the devices they won't fit. 4.0 out of 5 starsGreat value... but may not fit in all your devices. 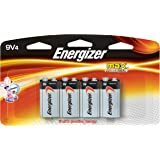 1) This 8-pack works out to $1.62 per battery (~$1.30 per battery for Prime members). Not many stores offer a comparable deal for 9V batteries (not including no-name or off-brand/dollar store offerings). For example, Costco sells an 8-pack of standard Duracell CopperTops for $20.99 (or $2.63 per battery). Most big-box chains and home improvement stores (e.g. Walmart, Home Depot, etc.) sell 4-packs for $13-15. Therefore, you save at least $1 (but usually more) per battery by buying the AmazonBasics product. That really adds up if you have a lot of 9V-powered devices and/or go through batteries quickly. 2) These batteries have excellent longevity. I keep track of when I install new batteries and, so far, have found that these batteries last approximately 90% as long as name-brand batteries. The only batteries that displayed a substantially longer lifetime (up to 25% longer) were Duracell Quantums... which cost approximately $6 each, even in multi-packs. 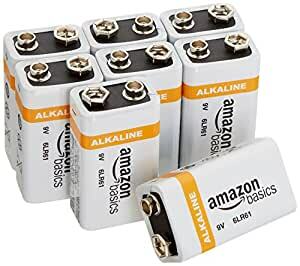 So, once again, these AmazonBasics batteries provide a very good value. A millimetre here or there doesn't seem like a lot, but it can actually be a showstopper. Many reviewers have noted that the AmazonBasics 9Vs won't fit in a variety of their devices, either because the batteries are too big or the terminals are too short. This was true in my case, as well. 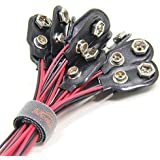 I tallied up all of the 9V-powered devices in my house and tried the AmazonBasics batteries in them. Of the 23 devices (yeah, 23! ), they wouldn't fit in 10 of them. Four smoke detectors, a digital postal scale, a portable headphone amp, a guitar tuner, the battery backups for two AC-powered CO detectors, and the battery backup for a clock radio. Nine of these devices use hard plastic battery holders that are just a bit too tight to squeeze the batteries into. The other device uses a battery holder (similar to Yosoo 3pcs 9V Plastic Battery Holder, DIY Battery Storage Case BOX ON/OFF Switch w Cap/Cover ) with connectors that refuse to snap on to the shorter terminals. Meanwhile, all of the devices that could accommodate the AmazonBasics 9Vs had larger battery compartments using cables with snap-on terminals. 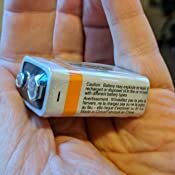 After researching online, I found that AmazonBasics batteries offer excellent run time, even though they are drastically cheaper than Duracell or Energizer. 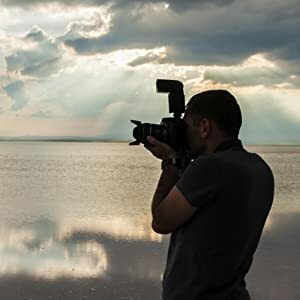 I've since switched exclusively to AmazonBasics batteries and buy them for everything with great results. these batteries are ok but... reason i give it two stars is that they are a bit thicker then standard 9v batteries so they wont fit if the fit is exact i bought them for a exact fit and now i am stuck with 8 9v batteries that i cant use due to them being a big thicker then standard 9v batteries V..
Bought these batteries to use with all my guitar pedals. It's true what others have said about them being slightly bigger than a regular duracel 9 volt battery. So far I've had no problems with them. They all fit in my pedals. Working great, as expected. 5.0 out of 5 starsGreat! They are batteries - they work, they ship quickly, and they aren't expensive. Works great for our smoke and cm detectors. I don't have anything else in my house that uses these style of batteries. Amazon has the best general price on their batteries, they work well like other decent brands and they don't cost nearly as much as some other brands. I appreciate that they come in useful little carboard boxes and open and close, and not bubble packs like most batteries - makes storing them MUCH easier and more convenient. 5.0 out of 5 starsGood value. Bought the first set of 8 in Dec 2016 for a line-dance teacher. She uses her tape recorder three to fours hours per day, four times a week. She just told me she has about two left and asked me to get her another box. So one box lasts about a year for her. She thinks these are really good value and quality is comparable to other brands. People commented these are slightly longer than the other brands, but my friend does not notice any difference. Also I got these during Amazon Prime sale.